(Mens M) Ugly Xmas Sweatshirt! Radio City Christmas Spectacular W/ The Rockettes! Home > Ugly Christmas Sweaters > Ugly Christmas Sweatshirts > (Mens M) Ugly Xmas Sweatshirt! Radio City Christmas Spectacular W/ The Rockettes! Vintage ugly Christmas sweatshirt! Amazing vintage sweatshirt from the Radio City Music Hall Christmas Spectacular! 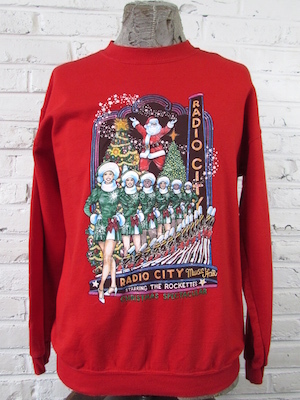 Sweatshirt has a red base and with an image of Santa, The Rockettes, and tumbling toy solider boys agains the Radio City Music Hall. The print on the shirt is embellished with puffy paint and glitter! Tagged Radio City Music Hall. 100% Acrylic.